Since their breakthrough hit single in 2012 with “Feel the Love” (feat. John Newman), the U.K.-based band Rudimental has continued to grow in popularity and build an international following. They’ve released a steady flow of hit songs, and have collaborated with some of the biggest U.K. music stars, including Ed Sheeran, Jess Glynne, James Arthur, Tom Walker, Anne-Marie and Rita Ora. Rudimental has just released their third album, called Toast To Our Differences (on Major Toms/Big Beat Records). This is an excellent album that combines many guest artist performances with the group’s strong songs and unique blend of high-energy and rhythmic tracks. The title of this album celebrates the diversity of different people in the world, and musically, this album expertly merges pop, dance, hip-hop and world music. Rudimental consists of four main members—Amir Amor, Piers Aggett, Kesi Dryden & Leon “DJ Locksmith” Rolle—plus additional members for touring. Aggett, Dryden and Locksmith formed the band early on, and then were joined by Amor, who is known as a top writer/producer in the U.K. who has also worked with Sam Smith, Charli XCX and other artists. Toast To Our Differences contains 13 songs (plus 3 more on the deluxe edition), and two of the songs have already been big hits in the U.K., Europe and Australia. “These Days” (feat. Jess Glynne, Macklemore & Dan Caplen) reached #1 in several countries, and “Sun Comes Up” (feat. James Arthur) was a Top 10 hit. Other key songs are the title cut, “Let Me Live” (a collaboration with Major Lazer feat. Anne-Marie & Mr. Eazi), “Walk Alone” (feat. Tom Walker), “Summer Love” (feat. Rita Ora) and “Scared of Love” (feat. Ray BLK & Stefflon Don). We are pleased to do this new Q&A interview with Amir Amor of Rudimental. He discusses the making of their new album, and how they’ve collaborated with Ed Sheeran, Jess Glynne and James Arthur. Before we get started, here is some additional information on Rudimental. They have previously released two albums that reached #1 in the U.K.: Home (in 2013) and We the Generation (2015). Their earlier hits include “Feel the Love” (feat. John Newman), “Not Giving In” (feat. John Newman & Alex Clare), “Waiting All Night” (feat. Ella Eyre), “Right Here” (feat. Foxes), “Bloodstream” (feat. Ed Sheeran), and “Lay It All On Me” (feat. Ed Sheeran). 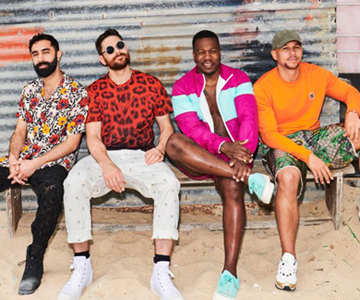 Rudimental has launched a major concert tour for 2019, that includes shows in Germany, France, Australia, New Zealand, United Kingdom, South Africa and Singapore. DK: How did the four of you meet, and decide to form Rudimental? Amir Amor: Kesi, Piers and Leon all grew up together and actually formed Rudimental a few years before I joined. I heard about the boys through Black Butter Records—who I was producing for around 2012 and they had heard of my studio Major Toms in East London. I’ve always been known as the “finisher” as I’m good at helping artists bring their songs together! The guys came to my studio and we created “Feel The Love”, “Not Giving In”, “Spoons”, “Waiting All Night” and the rest of Home, the first album. The chemistry was great and eventually I decided to join the group! DK: Your first big hit was “Feel the Love.” Can you talk about how you and John Newman wrote this song? Amor: The song actually started in Kesi’s mum’s house—he was originally singing the demo vocal and was too shy to get it out. We then met John Newman at a pub one night—he was singing open mic night. We were taken aback by his vocals so we asked him to come to the studio and the rest is history! DK: You’ve had terrific collaborations with Ed Sheeran on “Bloodstream” and “Lay It All On Me.” How did you connect with Ed and write these songs with him? Amor: I’ve known Ed Sheeran personally on and off since 2006. He was always rolling around to parties with his guitar, always singing open mic nights and everything in between. He’s one of the most hard-working guys I know, alongside us :). We’re on the same label as him and we both signed our deals at similar times, so it’s natural we were going to work together. He’s a good friend of ours and we went on tour with him around America—we wrote a lot with him on the road. He invited us down to his studio in L.A. once and we wrote “Bloodstream” together in the room. I think Ellie Goulding and the Game were floating around the studio too! Ed put “Bloodstream” out first on his record—we were credited as writers on that song and Rick Rubin produced it. The original version from the session is the one we released though on our second album, We The Generation. DK: The title track of your new album is “Toast To Our Differences.” Can you talk about your new album, and how this song title celebrates the diversity of cultures, styles and sounds? Amor: We wrote Toast To Our Differences at the time of Brexit and Trump’s election—mainstream politics and media seemed to be delving further into confusion and divisiveness. We were feeling quite hurt by it all, and wrote this song with our amazing beautiful friend Shungudzo (Shun). After we wrote that song, we felt inspired to write an album along the lines of this theme…we loved the sentiment. Here’s the video of Rudimental’s hit “Sun Comes Up,” feat. James Arthur. DK: How would you describe your songwriting process? Do the four of you usually write most of the song first, and then finish it with the artist? Or do you like to sit with the artist and create the song together? Amor: We usually jam in the room together. Piers and I are more techy so we bring the beats together too. We work with singers and allow them to have freedom whilst keeping with our theme. DK: I really like your song “These Days” featuring Jess Glynne, Macklemore and Dan Caplen. Can you talk about how this song came together? Amor: “These Days” started with a demo we were sent from Dan Caplen. We loved the idea and got in the studio with him. We had the song for a while before deciding to get Jess on it, who’s been our pal from back in the day—we’ve toured and played loads of shows with Jess. We then also reached out to Macklemore, who we’d met whilst on tour in the U.S. with Ed Sheeran. It’s not a proper Rudi tune unless it’s a big collaboration! It felt huge by this point. Not many people know we actually recorded Ladysmith Black Mambazo on the song too, they’re a legendary group that we all love. DK: I also like your song “Sun Comes Up” with James Arthur. How did you write this song? I noticed that you wrote it with Cass Lowe, who co-wrote several songs on your new album. Amor: Cass is a good friend of ours and we write together regularly—he appears a lot on this album! The song started with us in the studio together. We had the song for ages but didn’t have the right voice for it yet. Then we heard an interview on the radio with James Arthur, where he’d said that he wouldn’t do any collaborations unless it was with Rudimental. So we reached out to him and brought him to Major Toms—he absolutely smashed it! DK: Rudimental is known as a strong live band. Can you talk about your live shows, and will you be playing shows in the U.S. this year? Amor: Rudimental is a powerful live band! I can safely say that, because I love watching it now as much as I love playing in it! We’re a real family…we have so much fun together it’s unreal. What you see on stage is 100% live, no backing-track. I am now a non-touring member of Rudimental, I’ve taken a break from the tour life to work more on the creative side behind the scenes. I’m still of course behind all the music, but just not on stage anymore. We’re hoping to come back to America really soon—we absolutely loving touring there.